Every year the Southeast Climate Adaptation Science Center funds a multi-disciplinary cohort of Global Change Fellows representing colleges across NC State University. Here are some highlights about 2018-19 Fellow, Bonnie Myers, and the applied research she’s conducting. I study the impacts of climate change on natural resources, specifically the impacts of extreme events on fisheries in the Caribbean. My PhD work focuses on how severe disturbance events, such as hurricanes and drought, affect fish assemblage composition, how these extreme weather events affect native and non-native species differently, and how these changes impact the value of the resource to communities. What (or who) influenced you to go into this field of study? Canoeing, camping, and backpacking in the Ozark Mountain with my mom, dad, and brother from when I was very young ingrained in me a sense of stewardship for our natural lands and resources. I was always interested in science and understanding how ecosystems and organisms function. I initially got interested in the field of fisheries management as an undergraduate working in my first field technician position with the Wyoming Game and Fish Department. Through this experience, I was inspired to focus my career and research on freshwater fisheries science and conservation after working in streams and rivers all across Wyoming with the two state fisheries biologists. As I advanced in my academic studies and career, the overwhelming impact of climate change on our natural resources prompted me to combine my knowledge of fisheries with the impacts of environmental change to understand the effects of changing temperature and precipitation on our freshwater resources. 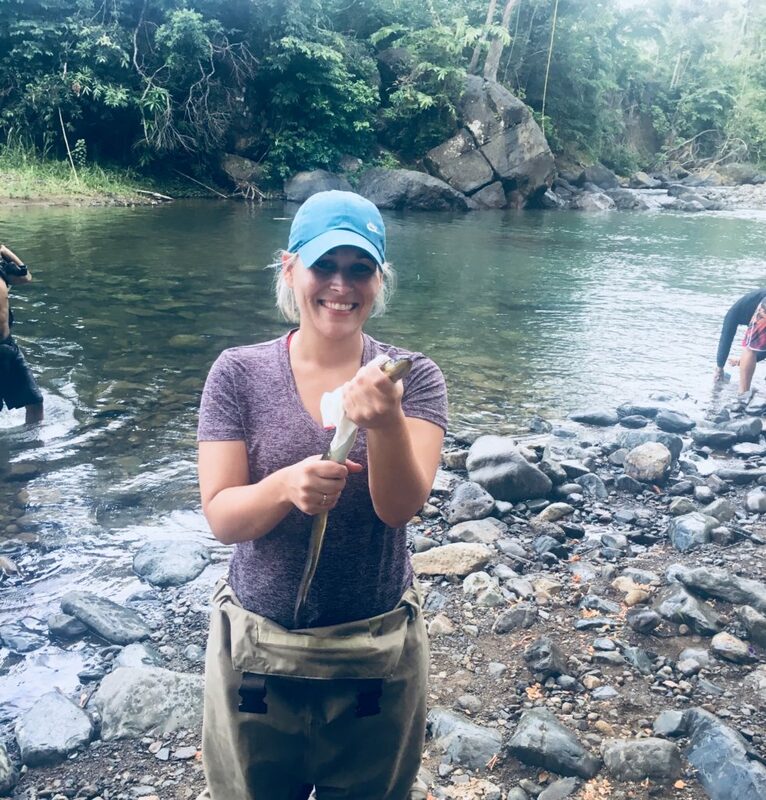 The most exciting part of my research is the native fish species I study, the combination of different fields of study in my work, and the location of my study system. My work is based on the island of Puerto Rico, which is in a very important region of the world, the Caribbean, and is particularly vulnerable to the threat of climate change and extreme events. What do you think is the most pressing issue related to global change? I think the most pressing issue related to global change are the impacts to biodiversity and composition of species in ecosystems across the globe, and the effects this has on how humans use the natural services provided by the environment (e.g., food, nutrition, agriculture, health, etc.). The program has already introduced topics to me that I hadn’t previously considered incorporating into my work (i.e,. Structured decision making) and has already expanded my network to other research and researchers affiliated with the center that could provide valuable information and guidance as I work through my PhD. How would you describe your research to a 3rd grader? I study how increases in temperature, hurricanes, floods, and drought affect fish and the streams and rivers they live, and what this means for fishermen and women, park rangers, and even you. Don’t be afraid to think outside the box when looking for opportunities to gain experience in the field. Talk to your advisors, talk to graduate students, talk to your peers, and engage with other researchers in the field. My experience is that scientists are more than happy to share their experiences and provide advice and opportunities to students. Lastly, take a chance. You never know what opportunity will lead you to your next job, graduate position, etc. My dream job is working where I can make the biggest impact and provide the most useful scientific information to managers and decision makers to develop the most appropriate and successful strategies to manage worldwide fisheries in a changing climate to benefit both the environment and human population.